As we know drinking coffee is a fun habit. Men and women, young and old like to drink coffee. Even for some people, drinking coffee can be done several times a day. In fact, drinking coffee has become a habit of residents all over the world. Please take a look at the graphs of European and American Countries that consume the most coffee. 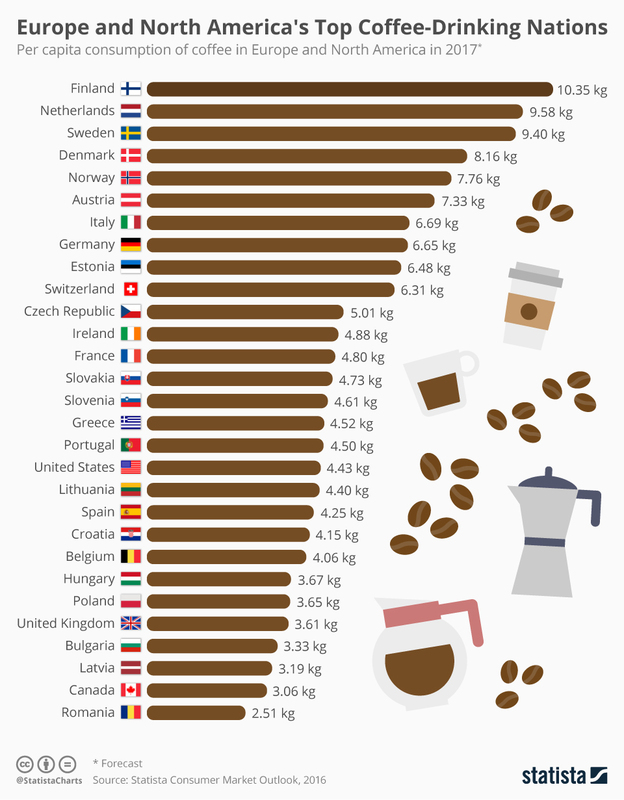 As we can see that Finland is the country where people consumes the most coffee in the world with 10.35 kg/Capita, followed by Netherlands 9.58 kg/Capita, Sweden 9.40 kg/Capita , Denmark 8.16 kg/Capita and many others there. It’s a proof that coffee is one of the most favorite drinks for people anywhere. Let’s knowing why people in the world like to drink coffee. Some people do not like bitterness so they do not like to drink coffee. 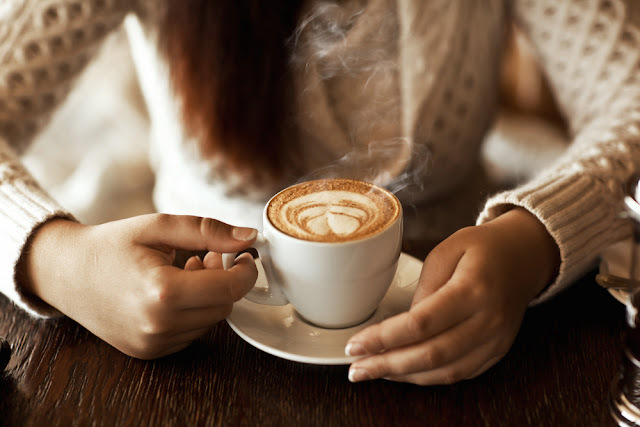 Most coffee drinkers also say that coffee is bitter, but they still drink coffee. May be the taste is optional. Some people say coffee is like alcohol. It does not taste good but makes it addictive to drink it. In addition, the aroma of coffee is very strong and delicious. Today there are a lot of very tasty coffee preparations. Creative people have turned coffee into delicious dishes. Bitter coffee has been widely processed into different fresh drinks but the typical taste of coffee is still there. Generally, we know that coffee contains caffeine. In medicine, caffeine is often used as a cardiac stimulator and increases urine production. In low doses of caffeine can serve as a source of stamina and pain relief. 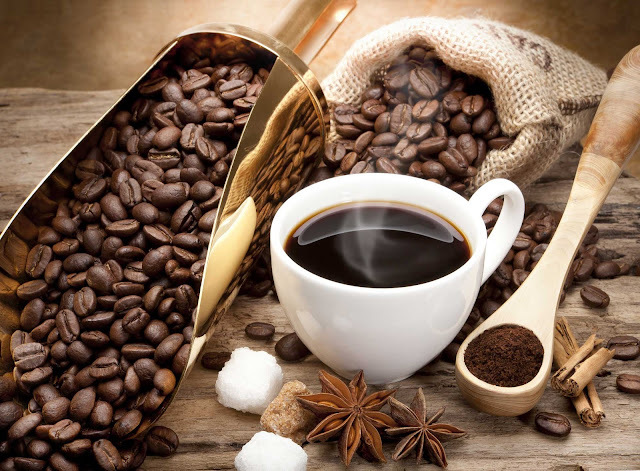 The mechanism of action of caffeine in the body is to rival the function of adenosine. Where caffeine does not slow the movement of body cells, but caffeine will reverse all the work of adenosine so that the body is no longer drowsy, but appears feeling fresh, slightly excited, eyes wide open, heart beat faster, blood pressure rises, muscles contract and the liver will release the sugar into the bloodstream which will form the extra energy. That is why various types of stamina generating beverages generally contain caffeine as the main ingredient. Currently coffee beverage business is growing very rapidly. There are many ways to find instant coffee. One of them is in the supermarket. We can find a lot of coffee brands there. Currently coffee beverage business is growing very rapidly. There are many ways to find instant coffee. One of them is in the supermarket. We can find a lot of branded coffee there at an affordable price. In addition, finding a cafe to drink a cup of coffee at this time is not difficult. We can find them along the way with a good coffee menu. We can stop by and enjoy the coffee with your friends.